In today’s tumultuous economic environment, it’s increasingly important that your company has trustworthy partners, whether it be in the form of conference space, education, employee benefits, health care, finance, office equipment, technology, transportation or a host of other services. 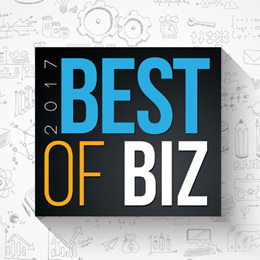 Our annual Best of Biz winners have proven themselves to be not only reliable, but resilient in their ability to get the job done. Comprised of editorial selections and readers’ picks, this year’s winners are sure to make your job just a little bit easier. PCH Technologies is celebrating 20 years of providing world-class IT and cyber security services to businesses in the South Jersey and Philadelphia region with a dedicated team that stays on top of the latest advancements in the IT and cyber security fields. 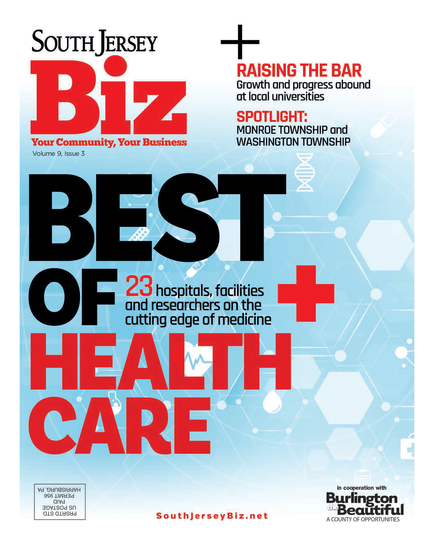 Locally, PCH was recognized as Best of Gloucester County IT Company in 2016. Nationally, the company was recognized as one of the five fastest growing partners in the country by Datto, a backup/disaster recovery/business continuity company at the 2017 DattoCon convention in Denver. Founded on June 20, 1940, South Jersey Federal Credit Union (SJFCU) is a diverse, fullservice financial institution serving more than 48,000 members and over 600 select employee groups throughout New Jersey and Pennsylvania. In the past year, SJFCU contributed a $25,000 endowment to Rowan College at Gloucester County to fund two scholarships annually over the next 10 years. In April 2017, the credit union received the Outstanding Service Award from The Free and Accepted Masons of New Jersey and was honored by the New Jersey Joint Assembly and Senate for its service to the community. With membership spanning across all 50 states, Labor First is the only retiree benefitmanager that solely services the union retireehealth care marketplace, handling retireehealth benefit and insurance needs of bothmulti-employer and public sector plan sponsorsand their retired participants. The companygives back to the community, partneringwith nonprofits like Toys for Tots and theAlzheimer’s Association. Their work hasearned the 2016 CRM Service Elite award presentedby CRM Magazine and a rank of 28 ofthe 2016 Philadelphia 100 list. Archer is a full-service regional law firm with more than 175 lawyers and eight offices in Haddonfield, Hackensack, Princeton, Flemington and Red Bank, along with Philadelphia, New York and Wilmington, Del. The firm has been serving Fortune 100 clients, small to medium-sized businesses and individuals for over 85 years. Each office provides full-service litigation and transactional capabilities in nearly every area of law, including corporate, estate and trust, family and matrimonial, labor and employment, litigation, medical and personal injury and real estate services. Through various partnerships and S-corporations, Nexus Properties owns and manages over 2 million square feet of commercial, office and warehouse space in Central and South Jersey. In addition, the company has developed five residential subdivisions totaling 296 single and multifamily homes and is currently developing 530 apartment units and 119 student apartments in South Jersey. Just this year, Nexus was named the best developer in Gloucester County by the Board of Chosen Freeholders and the Gloucester County Chamber of Commerce. The group also received the New Jersey Future 2017 Smart Growth Award presented by New Jersey Future and New Jersey’s Leading Infrastructure Projects award by The New Jersey Alliance for Action. Franklin Bank’s slogan—“Experience CommunityBanking at its Best!”—shows how committedthis homegrown institutionis to being a financialcornerstone for South Jersey.Drawing from its 156years of experience,Franklin has witnessedour area’s transformationover time and has establisheditself by catering tobusinesses and customerswho value the attention todetail that only a localbank can provide. From carefully sculpted lawns, shrubs and trees toother areas of propertymaintenance, Elite hasmade sure clients likeKennedy Health Systemand Adventure Aquariumlook their best by blendinga detailed knowledge oflandscape design with akeen sense of architectureto create aestheticallypleasing grounds. Its local presence and high priority on security aside, offerings like flatfee pricing and no extrahidden service chargeshelp make PROSHRED attractive to nearby customers in need of a personalized yet professionaltouch when it comesto disposing of sensitivedocuments. With 44 associate’s and bachelor’s degree programs to choose from—not to mention morethan a dozen master’sofferings and a slew ofcertification programs—Thomas Edison’s onlinecourses allow professionalsto work at their own pace as they look to boost their educational credentials. And because online discussions are a mandatory part of the grade, many find that they extend beyond the curriculum and into helpful dialogue surrounding their specific industries. This civil engineer firm doesn’t work for their clients, they work withthem, creating a collaborativeenvironment whereexecuting a shared visionis the main goal. Whetherthey are surveying land,conducting environmentaltesting or providing sitedesign expertise, TSE hasthe ability to seamlesslytake a project from inceptionto completion. Matters of personal finance can be complicated to navigate and fewunderstand this as well asM Financial owner TedMassaro. Thanks to hismore than four decades ofexperience, he is able toprovide a comprehensiveplan that is specific to theindividual and oftentimesthis includes preparing forthings before they happen.And his guidance hasbeen well received as evidencedby the fact thatthe average tenure of hisclients is more than25 years. Launched in 2006, Kavi got its start in the industryduring one of the country’smost difficult economictimes. Despite that hurdle,Kavi has steadily growninto one of our area’s mosttrusted construction managementfirms. And theversatilityextends to everythingfrom medical and industrialprojects to retail, office,food service and more. As the banking and continues to evolve, so does Capehart’sapproach to workingwith a range of clientsfrom community, regionaland commercial banks.Whether preparing loandocumentation for realestate financing or handlingbankruptcy litigation,the firm has built asolid reputation based onan intense understandingof the industry andmethods that producefavorable outcomes. This real estate development and management company gives deference to theirclients when it comes totheir desires so theycan avoid simplyduplicating what’s beenseen and done andinstead provide a customizedexperiencethat is successful onmany levels. It’s nowonder they’ve beenrecognized countlesstimes for outstandingachievement ineconomicdevelopment. This leading website design and marketing company has been helpingclients find an onlinepresence by outliningdigital strategies fornearly two decades. This includes everything frombuilding a webpagefrom scratch to improvingupon your existingsite. They’ll also outlineways to expand yoursearch engine optimizationand give you thetools to elevate yourbusiness by showcasingvarious marketing techniquesthat drive provenresults.